The Boston GreenFest has just reached its tenth anniversary this year, and increasingly focuses on raising people to create a more sustainable and healthier world. From business to nonprofit, neighborhood association to academic institution, State and city leaders, sustainability experts, students and citizens of all spheres of social life took part in the zero-waste event, focusing on issues such as racial equity, local food, transport, and trends Green technologies. As part of the event’s International Youth Summit, many young people from as far away as China, have opted for ‘alternative-formative holiday’ by joining the dialogue on climate change and the role of youth play. Among them the name of Jeremy Fryer-Biggs – co-founder of Evaptainers, a LAUNCH food innovator to address the deterioration of food and its enormous social and environmental impacts. Evaptainers uses EV8 technology to counteract the deterioration of fruit and vegetables thanks to the world’s lowest-cost fridge, powered by evaporation. Jeremy has revealed how difficult it is to start, especially when you have no relationship and it has warned the innovation community that it should limit barriers to young social entrepreneurs. His first suggestion was to reach young people to demystify the process of implementing a social enterprise, providing them with basics to know where to start. His second suggestion was to push them beyond the idea of action. Hence, and among other presentations, the need to design solutions in partnership with young and old, of various races and backgrounds, to ensure collective buy-in and collective action. And, above all, encouraging youth participation: Boston’s GreenFest has given ample test of this and it would be great for other cities to get the next generation of changemakers. Green EYE project is an interesting opportunity for connect new entrepreneurs, who have developed environmental ideas, with green business entrepreneurs with the aim of strengthening their expertise through international exchange. This program, financed by the European Commission under the Erasmus Program for Young Entrepreneurs, enables New Entrepreneurs and Green Business Entrepreneurs to increase their skills through international exchange projects. Thanks to co-financing, new entrepreneurs with an idea of a highly impacted enterprise may complete a 1 to 3-month on-the-job training period with experienced entrepreneurs from one of the Countries participating in the Program. GREEN EYE is realized by a European consortium that includes 5 partners: Holland (Van der Meer & van Tilburg, Amersfoort); Poland (Krakow’s University of Economics); Denmark (Aalborg University, Aalborg); Portugal (TecMinho, Guimarães) and Italy, with AlmaCube, the Incubator of the University of Bologna, together with Unindustria Bologna, generates highly innovative start-ups and spin-offs. In particular, the focus of the project is addressed to business ideas related to: Smart building; Green tech; Waste management; Reduction of environmental impact. The opportunity to put together good ideas and good practices to develop innovative businesses and mindful of sustainable development. Erasmus for Young Entrepreneurs is the cross-border exchange program that connects New Entrepreneurs (NE) – or aspirants – with already-established Entrepreneurs (HEIs) managing small or medium-sized enterprises in Another participating country. New Entrepreneurs can acquire the skills needed to successfully manage a small business in the world of Green Economy in Europe. The exchange of experience takes place within a working period at the headquarters of the experienced entrepreneur, helping the new entrepreneur to acquire the skills needed to manage a small business. Opportunities for the host entrepreneur are represented by the possibility of considering their business from different points of view, collaborating with partners and taking opportunities on new markets. Experienced host entrepreneurs, on the other side, can benefit from a motivated resource and ready to feed activities with innovative ideas, that are always valuable in such a profoundly evolving field. An interesting opportunity to connect ideas and business creation, focusing on sharing experiences and international exchange. A step towards the creation of a green business system capable of competing in the markets of innovation and environmental quality. What are you waiting for? Present your business plan! The young people are strongly encouraged to propose. You can find key answers to these questions in a short video animation that PiNA prepared within the international project European HUB model for socially responsible entrepreneurs. 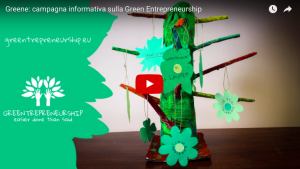 You can find about what does it take to be a Social Entrepreneur in a short video animation that PiNA prepared within the project European HUB model for socially responsible entrepreneurs. What is The EU Youth Hub? EU HUB is part innovation lab and business incubator, part community center – an unique ecosystem of resources for young people who are willing to dream and have a heart to fight for a better tomorrow. How to create such a supportive environment for young people with a desire to become socially-responsible entrepreneurs? Check-out the guidelines and information in the EU YOUTH HUB MODEL KIT, created by partners of the international project EU HUB Model. After the Green-E training was completed in Portugal, the participants of the training conducted training programs to youths back in Nepal. Campaign for Change-Nepal (CCN) realised the people needed some motivation to enter to the green entrepreneurship, their desire to enter into green programs. Since agriculture is the main occupational activity in Nepal and has a huge governmental focus, we decided to motivate the local people in Kathmandu to be involved in the green agricultural and environmental activities. Bagmati River, the holy river starts from the mountains of the Kathmandu Valley, runs through the Kathmandu and Patan and mixes to the other rivers in the South-East Nepal finally flowing towards the Indian Ocean. Bagmati River and its tributaries are the disposal a site of untreated sewages produced inside the Kathmandu Valley and is highly polluted. 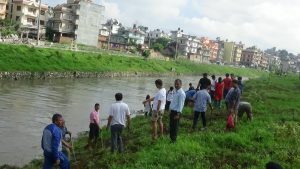 The government has launched Save Bagmati Program to improve the condition of the Bagmati River focusing the river water and the corridors of the river. The government handed the river banks to some organisations and the local community associations. The area of Subidanagar and Shankamul from the Bagmati flows was handed to the local community and allows them to improve and maintain the corridor area. Campaign for Change-Nepal (CCN), believing that once people are motivated to environmental sustainability and green activities decided to conduct the plantation program inside crowded and polluted Kathmandu. CCN collaborated with the local community of that area to plant the trees alongside the river and maintain the greenery in the riverside. CCN conducted training for the youths focusing the green sustainability of the environment through the trainees of the training program in Portugal. The training team then arranged about 200 plants of different species including several fruits species that were suitable to grow in that area. Along with the local community people, CCN volunteers planted trees in that area. There was a huge local participation and also the students from several colleges also joined the program. The plants were planted and watered daily and in month duration, the invasive grasses growing near the plants were cleared out regularly. The motto of the program was to encourage the youths and the local community to be involved in the green activities. Local people understood the necessity of green environmental activities and the possible entrepreneurship with green focus. 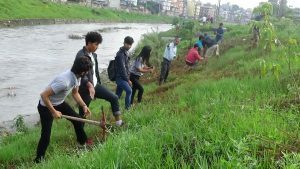 Receiving the success in the first program of the activities of Green E, CCN re-launched the plantation and awareness program in the continuing area of the riverside and arranged 270 plants of different fruit and timber species to continue the go green program in the Bagmati River. Again, there was a huge local participation as we successfully were able to grow several plants and maintain them regularly. The community people finally know that the waste reuse and fruit gardening can help to contribute to the community economy growth, this can develop some entrepreneurship in the green sector. The future is sustainable, make a green choice! Starting a business that embraces principles of sustainability is possible and for young people is a real opportunity for employment: it starts from a promising idea and from the acquisition of specific skills to develop it. Some aspiring young green entrepreneurs from Palermo did it and then realised an informative campaign “The future is sustainable, make a green choice” to sensitize the local community on the importance of green entrepreneurship. These are their questions: What is for us green entrepreneurship? What can we do? The informative campaign was developed within the project Greenentrepreneurship. Easier done than said. In October and November, the local group of young people was involved in local educational activities on green entrepreneurship. Innovation, green ethic, marketing and branding, development of the idea and business plan were some of the topics covered. Other result of the local educational activities are green business ideas that the young people will carry on. Similar activities took place in all the other project countries: Slovenia, Nepal, Tanzania, Portogallo, Argentina. Read the story of the local educational activities in Italy and the updates from other project partners’ countries in the III Newsletter di GreenE! The aim of the Greentrepreneurship – Easier done than said project is to develop skills, knowledge and competences of youths in order to improve their productivity and employability in the field of green entrepreneurship.